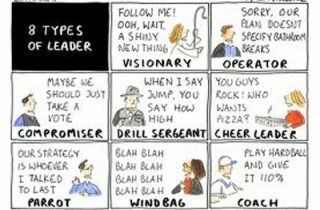 Leaders Lab / Your Leadership Style / What kind of leader are you? You’ve got your vision, your passion, and your strategy and plan. So why is it that despite displaying appropriate leadership competencies, you sometimes fail? In practice, there is one factor that distinguishes success and failure in leadership: your flexibility of style. Do you pride yourself on involving and engaging your team members in the work you delegate? Do you make huge efforts to include them, give them room to contribute, use their own initiative? And do you sometimes despair when, despite your best efforts, people still resist ownership, come to you for permission, or bring you problems rather than solutions? There is a very widely held opinion that ‘participative’ or ‘delegative’ leadership is in some way ‘better’ than ‘command and control’. You can hear it in the terminology: it’s almost as if one is more fashionable or politically correct than the other! In our leadership development work, we often meet leaders who resist ‘hands-on’ management of their people, yet complain that they don’t know why people don’t take initiative in their jobs. The usual assumption is that there is something wrong with the individuals and their motivation, or maybe with the circumstances surrounding them – the ‘culture’ of the organisation. This may or may not be so. But it is more likely that your leadership style is causing the very problem you are complaining about! The truth of the matter is that no one style of leadership is right for every person or every situation. It’s no more appropriate to pride yourself on your unvarying commitment to one style of leadership, than it would be to pride yourself on only ever using your forehand in tennis, or only one iron in golf! Is your leadership style failing?